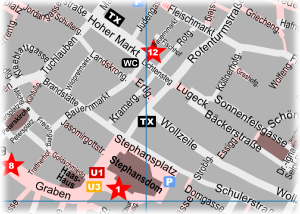 Opening hours: The place -Hoher Markt- is regularly round the clock accessible. Tip: The over 100 year old Ankeruhr clock offers a small special feature at 12 o'clock noon. For several minutes, all figures of the clock are presented during a parade with musical accompaniment. 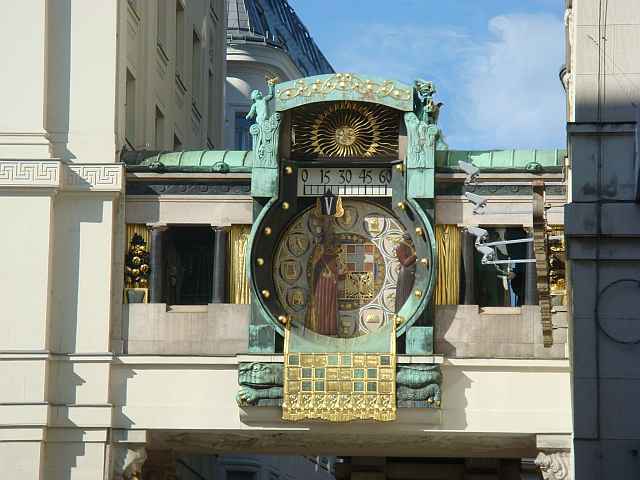 The Ankeruhr Vienna (D3) is a beautiful clock in the norther part of the inner city at the place -Hoher Markt-. The origin of this name is based on the important rule which it plaid in the past. -Hoher Markt- means a high (important) market. Already the Romans have built at this point in the old Vindobona officer houses. In the museum -Römermuseum- directly at this place you can have a look at numerous exhibition pieces and get more info about this period (link to museum below). In the middle age the place was the center for the bourgeois, for the textile and food trade. But there was also the place of execution with gallows, the pillory, the court house and the chapel here at the address -Hoher Markt-. The splendid mansions and palaces which surrounded the place were destroyed in the Second World War by aircraft bombs. Unfortunately these ruins were not reconstructed, but replaced by functional and typical buildings of the post-war period which now surround the formerly beautiful place -Hoher Markt-. The fountain Vermählungsbrunnen, which was constructed by Johann Emanuel Fischer von Erlach, was revealed in 1732. It consists mainly of marble and bronze and is dedicated to the wedding of Jesus Christ's parents, Maria and Joseph. The statues of Maria and Joseph and the high priest are located in the center on a base and are surrounded by four angels. These marble figures were made by the Venetian sculptor Antonio Corradini. By the way there is a very useful Art Nouveau construction directly at this place. It is a public toilet which is built in the underground. But fortunately there is also a specialty which survived the bomb attacks of the war. The clock Ankeruhr in Vienna. This unusual Art Nouveau work was created by Franz von Matsch in the period between the years 1911 to 1914. The k&k court clockmaker Franz Morawetz had made the clockwork mechanism. If you take a closer look you will recognize that the Ankeruhr is in fact an approx. 10 meter wide and approx. 7 meter high bridge. It connects the both parts of the Ankerhof buildings. The diameter of the clock itself is approx. 4 meter. As a tribute to popular historical personalities there are figures made of cooper in the clock. Over the head of these figures you can see the current hour in Roman numerals. And above this there is a horizontal scale to show the minutes. At every full hour you can see another personality passing the bridge escorted by a suitable background music. The highlight is at 12 o'clock noon. At this time you see a parade of some famous characters from Vienna's history. At a walk over the place Hoher Markt in Vienna passing by the Ankeruhr and the Vermählungsbrunnen you will maybe also recognize the ice cream cafe. The interiors are not looking very stylish but the partly exotic and in any case delicious ice creams are worth a visit.